Thank you for the quick and hassle free transaction sir! using the memory card now and its working perfectly. will definitely recommend you to my friends. sa uulitin po sir. thank you sir for the 4gb transcend kanina !!!! Sir maraming salamat po sa 32gb Original Sandisk Class 10 Mobile Ultra MicroSDHC UHS-I.. Ako po yung taga-pangasinan.. 2nd deal na po, more to come.. Napakadaling kausap at napkabait pa.. Hanggang sa uulitin! Thanks sa 32gb Orig Sandisk Micro Sd! Sa uulitin po sir! Thanks for the patience. Napuntahan ko na rin ang shop ninyo sa wakas. Item bought: April 13, 2013. 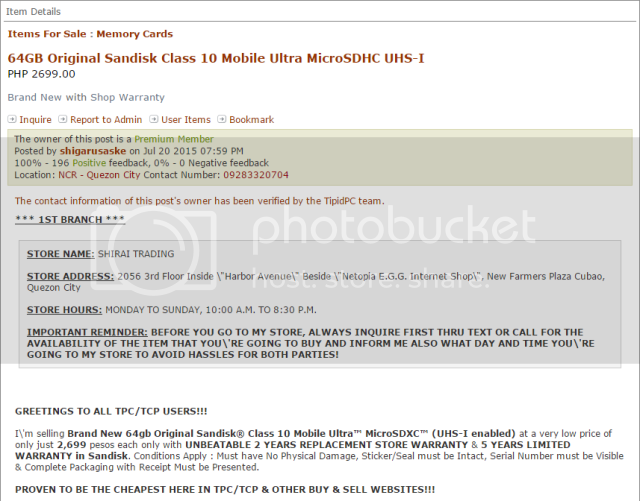 Thank you sir for Sandisk SDHC UHS-I and Transcend SDHC both 8Gb Class 10. Thank you so much Sir sa transaction. It was hassle free and very detailed in their items. Till next deal Sir! Highly recommended seller! after ko magdeposit sa BPI kahapon (FRIDAY) pinadala din niya ung ipad papunta dito sa CAGAYAN VALLEY.. Highly recommended talaga si sir shiga, 2nd deal to deal with sir and hindi ako nabigo..
Mabuhay ka sir! More deals to come. Sir salamat sa samsung core II, looks like brand new talaga. walang hassle sa pag transac. next transaction po ulit sir. mabuhay kayo! Sorry for the overly late feedback. I remember dealing with this seller for sdcards and he was very pleasant and accommodating. Thank you sir for the deal! Bought this item last Nov. 30, 2013. Feb. 7, 2014 - item broke and got replaced hassle free. Apr. 12, 2014 - item broke again and got replaced. Again hassle free. Jun. 28, 2014 - well well, item broke again and got replaced. Again hassle free. Feb. 4, 2015 - wow, item broke again and got replaced. But still hassle free. Jan. 19, 2016 - item broke again but this time, the seller refused my warranty claim. Okay na sana yung UNBEATABLE warranty kaso sumablay pagdating sa distro warranty. Seller told me that the supplier does not carry the model anymore and refused to have it upgraded to a newer model even if I need to pay the price difference. I even asked the seller to replace it with a lower model just so my phone can a memory card but no, instead he offered me to buy from someone he knew at a discounted price. So yeah, very nice to deal with. Hassle free transaction. Sumablay lang sa warranty. I hate to be the first negative feedback but you keep ignoring my messages for the past 3 days.